The Barcode Properties tab of the Object Information Panel is activated either by double click on the barcode object, or by using the correspondent option from the Object menu. Data: Editable string of characters for barcode encoding. Barcode Type: Use the Barcode pop-up menu. Height: Barcode height in inches. You can choose values from 0" to 2" in 1/4" increments from the pop-up menu. Bar Width: Defines the bar element width in dots and mils. Bar Height: Defines the barcode Height. 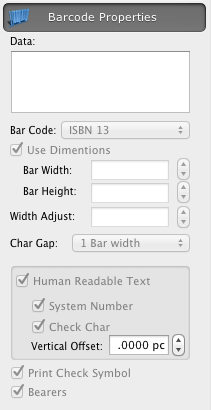 Width Adjust: Defines the bar width resuction in comparizon with space between bars. Required for Inkjet printers. Char Gap: Defines the Intercharacter gap value. Specific to Code 39 barcode. Human Readable Text: Print/Don't Print human readable text under the barcodes. The font, size and style of the Human Readable Text are affected by Font palette (Show Fonts option from the Object menu). Vertical Offset: Space between the barcode and text. Barcode Check Symbol: Print/not Print check symbol.